Look out for these five 7" singles from James Brown's People Records imprint house in a deluxe embossed carrying case! Continuing Get On Down's People Records deluxe reissues series - which launched on Record Store Day in April 2014 with the release of the JB's classic 1972 album ‘Food For Thought’ - this unique box is the celebration of James Brown's People label and some of the imprint's most famous singles. Each 45 has been lovingly re-created with visuals taken from the original artwork. 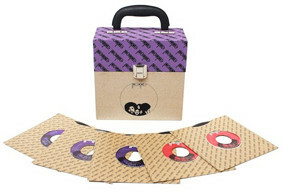 And beyond the singles themselves, this set includes a deluxe, cloth-covered carrying case with a People Records logo on the exterior and purple People embossing throughout the interior. The Devils - "Hip Hug Her"
Lyn Collins - "Think(About It)"
Lyn Collins - "Ain't No Sunshine"
Maceo & The Macks - "Cross The Track (We Better Go Back)"
Maceo & The Macks - "The Soul Of A Black Man"